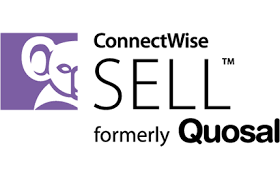 ConnectwiseSELL (formerly Quosal) is a quote and proposal software provider that helps sales professionals quickly and easily create professional quotes and proposals. Quosal was acquired by Connectwise in 2011. Order Porter is a sales solution that combines quote and proposal delivery, negotiation and order execution. Completely template driven, Order Porter customizes customer-facing web pages, so users have the ability to utilize any type of content to represent a brand and image, marketing information, and other content to impress, educate, support, and provide resources to the customer. Quosal Catalog is a product catalog management solution with easy access data for quicker quoting and proposals. Quosal Sell is a quote and proposal automation solution.